Tyre speed ratings tell you the maximum speed that particular tyre is legally approved for. This measurement ensures that the tyre you buy is appropriate – and safe – for the speed of the car it’s fitted on. Where do I find the tyre speed rating? The speed rating is displayed on the tyre’s sidewall, after the load rating. In this example, the car’s speed rating is W, which indicates that it has been legally approved for use up to 168 mph. How is the speed rating calculated? Speed ratings are based on laboratory tests in which the tyre is run at 6.2 mph steps, in 10 minute increments, until the required speed has been met. To receive its rating it must demonstrate that it can sustain a particular speed when tested with simulated loads. The speed rating is represented by a letter – A being the lowest and Y being the highest. 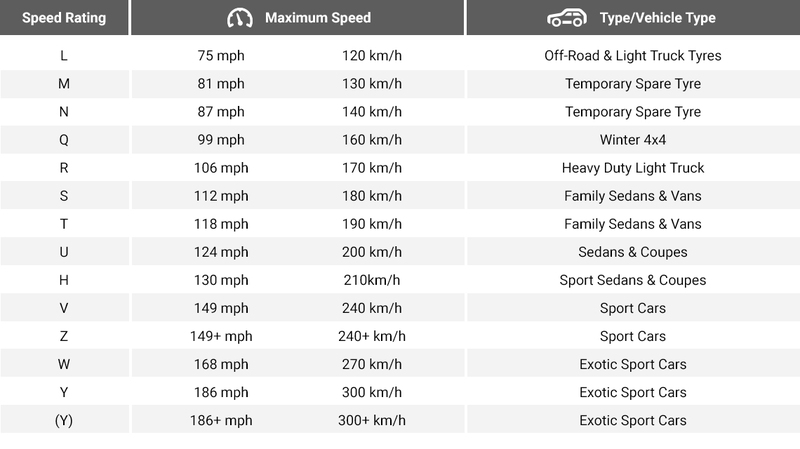 As you will see on the chart below, there are some anomalies as car manufacturers have increases the speeds of their vehicles and speed ratings have been introduced to match them. Are speed ratings just about speed? No. They’re also about ride comfort, traction, tread wear and cornering ability. A higher speed rating generally offers better grip and stopping power, but it may have a lower tread life and reduced performance in cold weather. That’s why V, Z, W and Y-rated tyres are usually better suited to high performance vehicles in warmer climates. You can increase the speed rating of your vehicle’s tyres for improved performance, but can never decrease it without reducing the vehicle’s top speed to that of the lower speed rating selected. Can I mix speed ratings on my vehicles tyres? If you are going to mix speed ratings, which we don’t recommend, make sure the lower rated tyres are on the front axle, regardless of whether your vehicle is front-, rear- or four-wheel drive. This is to prevent a potential oversteer scenario. Bear in mind that all tyres must be appropriate for the vehicle and you should drive no faster than your lowest rated tyres. We would always recommend that the same size and type of tyre, with the same speed ratings, are fitted on all tyres.